In recent commentaries we’ve written about the three phases of a bull market and how and why the final phase evolves as it does. Valuations, sentiment and market structure all explain why markets take a dramatic upward turn in the final phase after relatively stagnant performance in the previous phase. These are the “micro” behind why a bubble emerges in the final phase. Today we want to look at the intermarket driving forces behind the emergence of a bubble. We often write about intermarket analysis, which is an incredibly useful and actionable form of technical analysis. The greater the bubble, the greater role intermarket relationships play in the formation of the bubble. Essentially, for a large market to form a bubble, capital needs to flow out of various asset classes and into that particular market. Here is a quick example of the technology bubble in the 1990s. We plot the Nasdaq, Bonds and Commodities (the three major asset classes). The Nasdaq accelerated from 1994 to 2000. In the same time period, Bonds were volatile but didn’t make much progress. 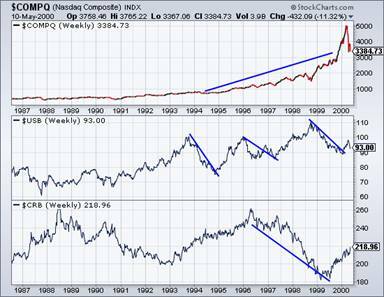 Commodities were in a nasty bear market from 1996 to 1999. Note that Bonds surged from 1990 through 1993, a period in which the Nasdaq climbed slowly. Furthermore, from 1993 to 1996, Commodities experienced a very strong bull market. The takeaway is bubbles cannot occur when the asset classes are challenging each other for supremacy. 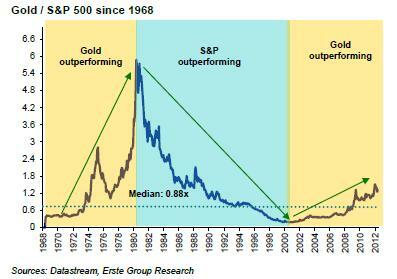 Let’s quickly review the parabolic move in Gold, Silver and mining equities from 1976 until 1980. Interest rates soared in that period (Bond prices declined) stoking greater fears of inflation. Meanwhile, the S&P 500 peaked in Q3 1976 and didn’t bottom until Q1 1978. Overall, precious metals faced little competition in the late 1970s from conventional heavyweights: Bonds and Stocks. Presently, the strength in each major asset class is holding Gold back. With both performing well, who needs Gold or Commodities? However, the long-term outlook for Stocks and Bonds is not good. The S&P 500 is nearing major resistance at 1500-1600. Also, the shortest bear market on record was 13 years (1929-1942). The current bear market looks far more similar to the 1966-1982 and 1900-1915 bear markets. Furthermore, the current PE ratio is 14. The bear market will not end until that reaches single digits in the coming years. Moving to Bonds, we note a powerful breakout from a two and a half year base. Bonds can move quite a bit higher from here but we’d be wary of a blowoff top in the next 12-18 months. We believe there is plenty of legitimate demand for Bonds. The economy is slowing and people are generally scared. 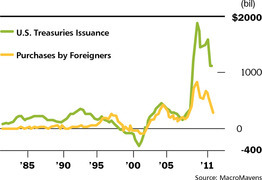 Also, if you are part of a large institution managing millions, you rely on Treasuries for their safety and liquidity. However, consider that foreign purchases are declining and supply will balloon in the coming years. Looking at the outstanding debt for the top 10 combined shows that just between now and the end of the year more than $5 trillion in debt will mature, or 17% of their total outstanding debt, and by 2015 nearly 50% of the top 10 debtor nations total outstanding debt will come due.That is more than $15 trillion in debt coming due in the next two and half years! One important point we need to remember is that the majority of gains in a bull market come in the last phase. The Nasdaq gained 5-fold from 1982 to 1994 and then surged more than 7-fold in the last six years. Gold and Silver in the late 1970s is another example. There are a handful of data points that support (on a historical basis) a parabolic move in the coming years. 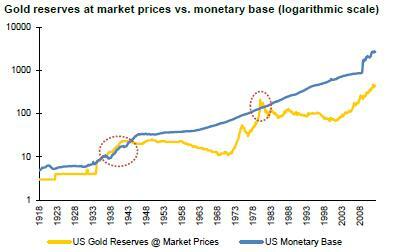 The following chart shows how much Gold would have to rise to back the monetary base. However, an updated calculation puts this at $10,000/oz! 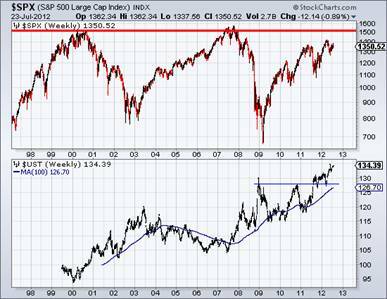 Moving along, we see that Gold relative to equities (S&P 500) has significant room to advance if it is going to near the 1980 bubble level. Note where the ratio was in 1977. Presently, Gold is struggling to find demand as Bonds and the S&P 500 remain in bull markets. However, we believe the cyclical bull market in equities will soon come to an end and that the secular bull market in Bonds could form a major peak in the next 12-18 months. Gold and hard assets have been in a bull market for nearly 13 years. Barry Bannister’s research shows that bull markets tend to average 16-18 years. 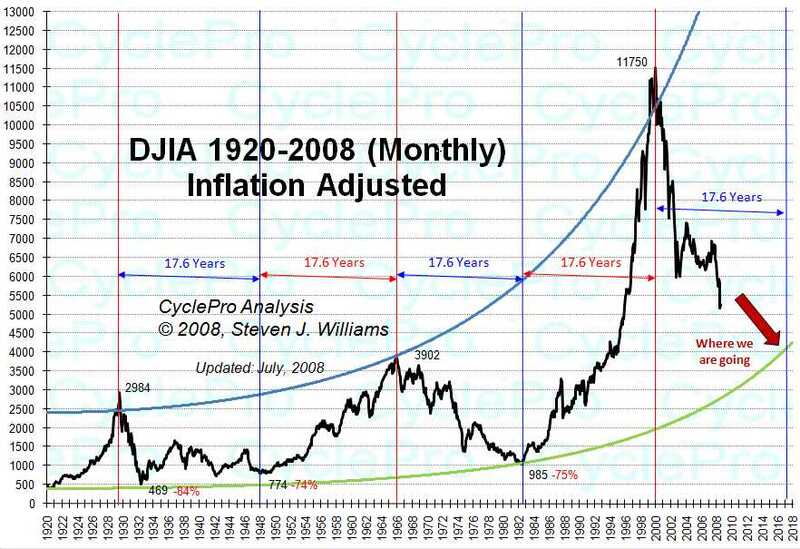 Steven Williams Cycle Pro shows that adjusted for inflation, each equities cycle is about 17 and a half years. The present bull market could very well end in 2017 or 2018. This is at the most, six years away. It could take several months for the S&P to peak and perhaps a year before it falls into a mild cyclical bear market. Meanwhile, it could take months or perhaps a year for Bonds to make that major peak. Regardless of the near-term, the outlook over the next few years is clear. Conventional assets will struggle and fall out of favor at a time when accelerating debt monetization and money printing will thrust Gold, Silver and hard assets into the mainstream. That is why now is the time to take a serious look at Precious Metals. In our premium service we focus on the producers and explorers best positioned for and most likely to take advantage of the inevitable next leg up in this bull market in precious metals. If you’d be interested in professional guidance in this endeavor, then we invite you to learn more about our service.